QUESTION 1 : The candidate from our constituency was attacked during his __________ for the MP elections. She is an __________ writer. Everyone in the industry respects her. Irritate and Nettle are synonyms. Both mean to excite a feeling of anger. Rest all are antonyms. QUESTION 4 : Select the most appropriate option that would solve the problem. Problem – What is the profit made by the shopkeeper? (I) The shopkeeper sold 200 articles at Rs.10 each. (II) The profit per article is same as the cost price per article. Total 200 articles are sold. Therefore, both (I) and (II) are together sufficient, but neither alone. QUESTION 5 : What is the probability of getting atmost two tails when an unbiased coin is tossed thrice? Desired options are HHH, HHT, HTH, THH, HTT, THT, TTH. Statement – A large number of people from city S are moving to city T owing to extremely high temperature. (I) City T has lower temperature than city S.
(II) City T has adequate resources to meet this shift. I is true as city T must be having lower temperature than city S. That is the reason why the people of city S have decided to move to city T.
QUESTION 8 : A bag contains 5 balls out of which some or maybe all are black. 2 balls are drawn from the bag and both are found to be black. What is the probability that all balls in the bag are black? Since 2 black balls were drawn, the number of black balls may be either of 2,3,4,5. Since the number of black balls is unknown, all events A2, A3, A4, A5 are equally likely. QUESTION 9 : Answer the question on the basis of the given table. If the number of male post–graduate employees in company H is 1800, what percent of female employees in that particular company is NOT post–graduate? Hence, required percentage = (312 / 1200) * 100 = 26 %. QUESTION 10 : Answer the question on the basis of the given table. Which company has the highest number of employees per office? QUESTION 11 : Given h(z) = (z+2)2 + 3(z+2) – 8, determine two functions f(z) and g(z) which when composed together as f(g(z)) will generate h(z). There is a property in limits that limx–>0 (cos x – 1) / x = 0. Selection sort has a complexity O ( n2 ) in every case. Insertion sort has the best case when the input is already sorted. Every insert requires constant time. Heap sort has a complexity O ( n log(n) ) in every case. Which of the following is true about above code. T(n) = 2 T(n–1) + c, which is O(2n). Since there can be atmost O(n) elements in function call stack, extra space required is O(n). Which of the following is true about the function in the above code. A) Returns true if there are two subsequences of arr with product as X. B) Returns false if there are two subsequences of arr with product as X. C) Returns true if there is a subsequences with sum of squares equal to X. D) Returns false if there is a subsequences with sum of squares equal to X. The function represents code for a variation of subset sum problem. Here we find if there is a subsequences with sum of squares of elements equal to X or not. So, A,C and D have the same position. Thus, 3 is the required answer. 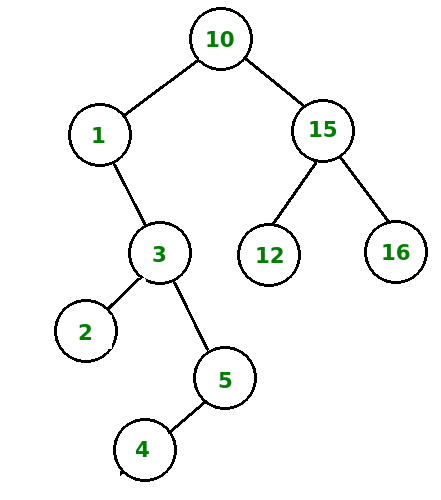 QUESTION 17 : The following numbers are inserted into an empty binary search tree in the given order: 10, 1, 3, 5, 15, 12, 16, 4, 2. What is the height of the binary search tree? The height of a binary search tree is the maximum distance of a leaf node from the root. When we make the LL(1) parse table, we get a conflict in E row. Thus, the given grammar is not LL(1). QUESTION 20 : Which of the following sets will have same number of elements in their power set? QUESTION 21 : Consider a 4 – bit Johnson Counter initialized to ‘0000’. What is the number of clock cycles required for the counter to reset to ‘0000’? The Johnson counter resets the input, i.e., reaches the initial input in ‘2n’ clock cycles, where ‘n’ is the number of bits. 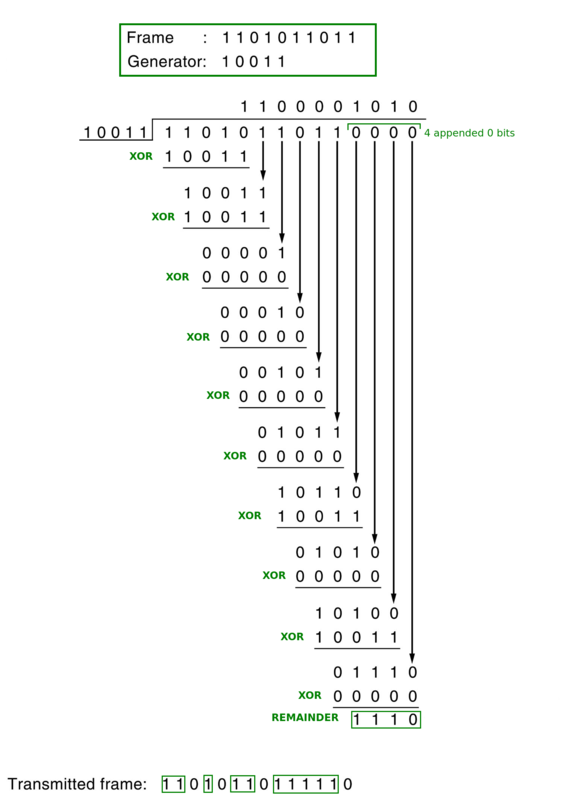 So, for 4 – bit counter, the counter will reset in 2 X 4 = 8 clock cycles. In register reference instructions, the first 12 bits (0 – 11) specify the register operation. The next three bits are 111 and specify opcode and the last bit of the instruction is mode which is 0. Therefore, last 4 bits are always 1110. QUESTION 23 : Which class of ports does the port number 48151 belongs? Port numbers 1 – 1023 belong to the ‘well – known’ ports. Port numbers 49152 – 65535 belong to Private ports. QUESTION 24 : Consider the fragment offset field in the IPv4 header. What is its maximum value in bytes ? The length of fragment offset field is 13 bits. 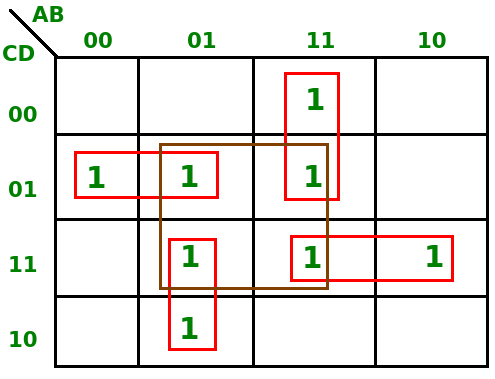 Also, fragment offset is measured in 8 – byte blocks. So, maximum offset is (213 – 1) X 8 = 65528 bytes. QUESTION 25 : Match the protocols with the port numbers. Making a DFA is all that is required to get the correct answer. QUESTION 27 : Assuming a 16 – bit address space with 12 logical pages. What is the size of each page ? It takes 4 bits to reference 12 logical pages (24 = 16, so maximum 16 pages can be referenced in 4 – bits). Now, we are left with 16 – 4 = 12 bits, which can be used for pages. For calculating ‘m’, any non – zero value is considered TRUE. In conditional operator, ++i makes i = –1, which makes it go to the TRUE case of the conditional operator. Now, ––k will return 0 and since there is AND after that, it will not be calculated any further as False && False or False && True will always return False. So, i = –1, j = 2, k = 0, m = 0. QUESTION 29 : Consider a table STUDENTS and the following two SQL queries. Both the queries will remove all the rows from the table. But, query 1 can be undone by using rollback whereas query 2 is permanent. Also, DELETE fires all the associated triggers whereas TRUNCATE does not. What is the sum of all the elements of the L and U matrices as obtained in the L U decomposition? So, the sum of all elements is 9. Computation for ‘i’ would be done using integer arithmetic whereas for ‘j’, it would be done using double or floating point arithmetic. Also, the precedence of ‘*’ and ‘/’ would be same and the expression would be calculated from Left to Right. QUESTION 33 : Consider a network path with three links. Assume processing delay to be zero. A data packet of 500 KB is sent from a source to a destination via the path : link 1 – link 3 – link 2. What is the total delay in transmitting the packet? ii) Heap is preferred over Linked list for implementation of Doubly Ended Queue. iii) Heap is preferred over Binary Search Tree for implementation of Priority Queue. iv) To heapify a node in Heap, all subtrees of the node must be heapified. v) If we use Singly Linked List instead of array for implementation Heap, then time complexity of build heap increases. 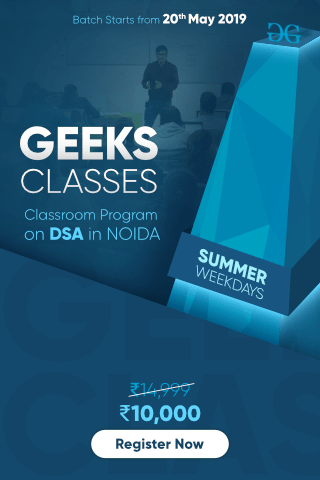 (v) Build Heap requires random access to find first internal node and to find parents of nodes which is not possible in (1) time with linked list. QUESTION 36 : Assume CSMA/CD protocol. Find the least frame length in bytes for a 2 Mbps bit rate and 1.5km long network where propagation delay is 4.25 nano seconds per metre. QUESTION 37 : Which of the following has the longest range ? WiFi : 802.11n has the highest range among the other given choices. QUESTION 38 : Which of the following follow commutative law but not associative law? All gates follow commutative law. AND, OR, XOR and XNOR follow associative law. On opening the summation, we would be left with (1) + (1/2) – (1/11) – (1/12), which is equal to 175/132. Taking upto 2 places after the decimal, we get 1.32 as our answer. QUESTION 40 : Consider a function f(A,B,C,D) defined by the summation of the terms 1, 5, 6, 7, 11, 12, 13, 15. What is the value of function ‘f’ in the SOP form? 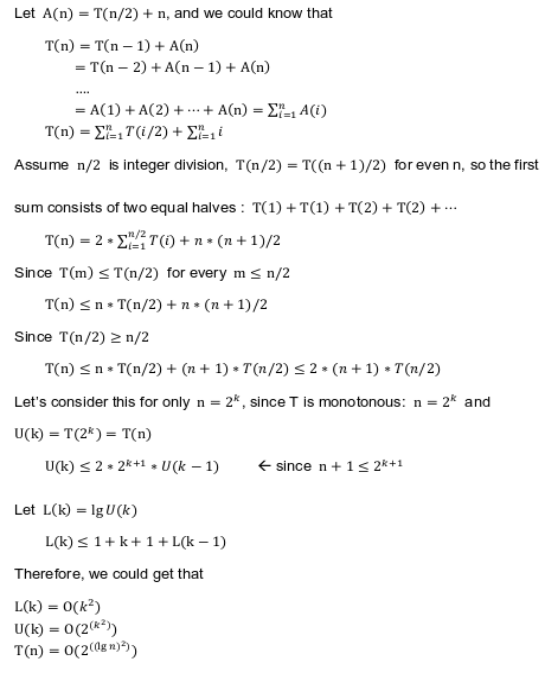 QUESTION 41 : Consider the recurrence relation T(n) = T(n–1) + T(n/2) + n.
The Grammar is ambiguous. For a string “abab” two derivations are possible and no ambiguous grammar can be LR. (ii) The Automaton is a DFA. (v) The Language accepted by X contains words that contain at least one x, y, y and x in that order. (ii) is false: as we can go to multiple next states from state 1 and symbol x. QUESTION 45 : Which of the following statements are true? S1 : A language accepted by Non – Deterministic PDA can also be accepted by Deterministic PDA. S2 : A language accepted by Non – Deterministic FA can also be accepted by Deterministic FA. S3 : A language accepted by Non – Deterministic Turing Machine can also be accepted by Deterministic Turing Machine. QUESTION 46 : Consider three processes P1, P2 and P3 arriving at 0ms, 4ms and 10ms respectively and have burst times 8ms, 4ms and 1ms respectively. Which of the following will have the highest average waiting time ? Round Robin with time quantum 1 will have the highest average waiting time of 3ms. Rest all will have average waiting time less than 3ms. Which of the above are True ? It is possible to design JK flip flop using T flip flop. What is the approximate speed up of the pipeline in steady state under ideal conditions when compared to the corresponding non-pipeline implementation? What will be maximum and minimum number of tuples in natural join of R and S? QUESTION 50 : Select the option that will give highest number of page faults for the sequence – 7, 0, 1, 2, 0, 3, 0, 4, 2, 3, 0, 3, 2, 1, 2, 0, 1, 7, 0, 1. Round off the answer to the nearest integer. Th eigen values of the matrix are 1, 2 and -2, the product of which is -4. Taking mod, the answer is 4. QUESTION 53 : Consider the following query on a relation REL(X,Y,Z) with candidate keys X and Y. The result of which queries will be equivalent ? If there is compile error, your answer should be 99. If there is runtime error, your answer should be 999. If the answer is any junk value, your answer should be 9999. Inside fun(), q is a copy of the pointer p. So if we change q to point something else then p remains unaffected. QUESTION 55 : Consider a Binary Tree where the allowed height difference between left and right children of every node is at most one. What are the maximum and minimum possible heights of such a Binary Tree ? 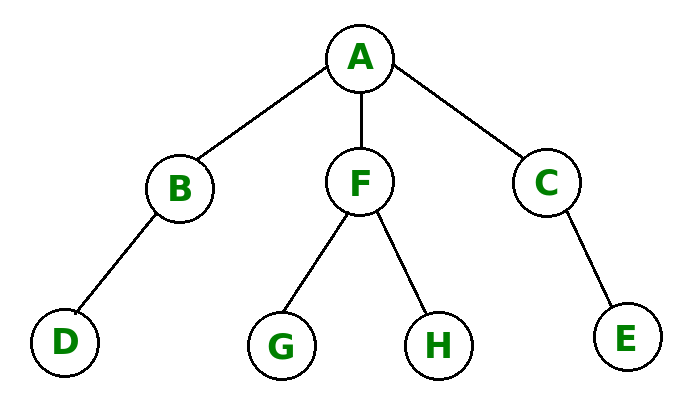 The binary tree as per the question would be an AVL Tree. Height of AVL would be minimum when tree is complete like Heap, which is floor(log n). Height would be maximum when differences between heights is exactly one for every internal node, which is approximately 1.44 log n.
QUESTION 57 : Consider a system generating 20 bit frames and connected through a shared 20kbps channel. Find throughput in percent if slotted ALOHA is used and frame rate is 1000 fps. Your answer should be rounded off to the nearest integer. QUESTION 58 : Consider a graph with ‘n’ nodes such that 1 node is master node and all other are slave nodes such that the master is connected to all slaves but no two slaves are connected. What is the chromatic number for such graph? Lets say that we give color RED to master. Since slaves are connected to the master, no slave can be given RED color but since all of them are mutually unconnected, they all can be given same color, say GREEN. So, we need only two colors. The structure of all lexemes(of any length) in the program can be verified & described by a Regular Grammar, and a Regular Grammar can be described using a Regular Expression. QUESTION 62 : A relation R has no composite candidate keys. Which of the following is always true for relation R? A relation without composite keys will always satisfy the conditions for a relation to be in 2NF. QUESTION 63 : Consider a frame 1101011011 and a generator polynomial 10011. What is the number of 1’s in the transmitted frame? So, the number of 1’s in the transmitted frame is 10. QUESTION 64 : Consider a symmetric key cryptography system with 15 users. What is the number of keys required for this system? Routers use Longest Prefix Matching rule. 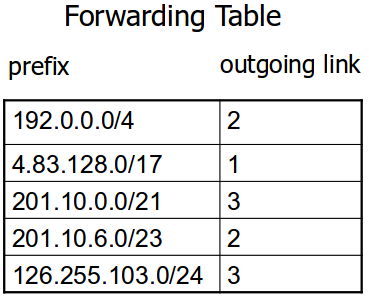 The rule is to find the entry in table which has the longest prefix matching with incoming packet’s destination IP, and forward the packet to corresponding next hop.